This incredible encounter was filmed by photographer Siddharth Gandhi in Lamar Valley, a region of the park that's been hailed a wolf hub since the animals were reintroduced in 1995. 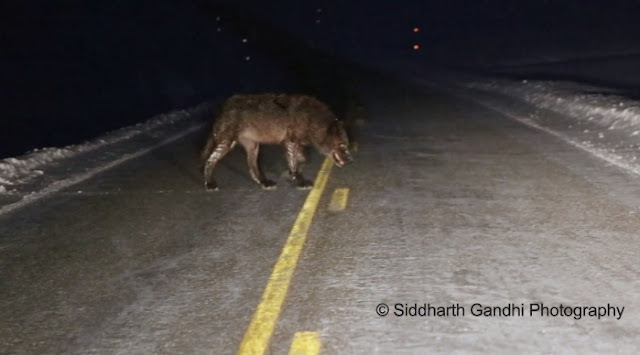 "We were driving back in the evening when the wolf appeared on the side of the edge of the road," recalls Gandhi, who immediately stopped his car to let the animal move on safely. 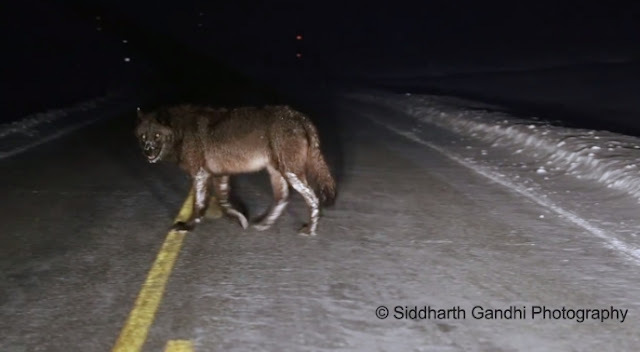 "It was an amazing experience to see a wild grey wolf so close. I was in awe." But why is this grey wolf sporting a black coat? Despite their name, these animals come in shades that range from pure white to mottled grey and even black. This stunning female (who we're pretty sure moonlights as Rickon Stark's direwolf) is a member of the Prospect Peak Pack, a group that currently has ten members. Grey wolves once roamed across North America, from Alaska all the way to Mexico, but habitat loss and unregulated extermination programmes saw them all but disappear by the early 1990s. To give populations a boost, 41 wild wolves from Canada and Montana were released into Yellowstone in the latter part of that decade. Today, at least 98 wolves in ten packs live primarily in the park, and over 500 can be found in the greater Yellowstone area. "I believe this individual is known as 'White Dot'," says Gandhi. "There is a lot of misunderstanding about wolves. They are an important part of the ecosystem. I am really impressed with how intelligent they are." Gandhi's early encounters with wildlife left a big impression. He regularly visited national parks in both the US and India as a child, and still makes regular photographic pilgrimages. Because his goal is to showcase wildlife in a natural setting, he captures his images without the use of bait. That means his encounters can be both short and unpredictable, but Gandhi is appreciative of each glimpse. 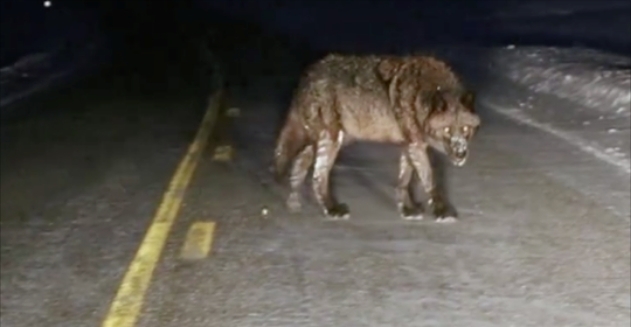 "Eventually the wolf seemed to lose interest in our vehicle and it just headed off the road," he says. "It was very dark so we lost sight of it almost immediately. I felt extremely lucky." Responses to "Incredible Encounter: Photographer meets a big, burly wolf in Yellowstone "
Thank you for this moment of time. A beautiful, electric, wise creature, who deserved all the help they could get. Great job to everyone. Can you imagine meeting up with that in the dark or even during daylight hours. They are definitely meant to be in the wild to do their thing. Those feet are huge. Such shiny fur. She looks healthy .